To the uninitiated, the mention of sushi often conjures images of raw fish. However, there are many types of sushi that don’t contain any fish. Sushi rolls are made with seaweed, rice flavored with vinegar, and vegetables or fish. Most sushi varieties are very nutritious and low in calories and fat. Sushi made with brown rice has the added bonus of providing even more health benefits. 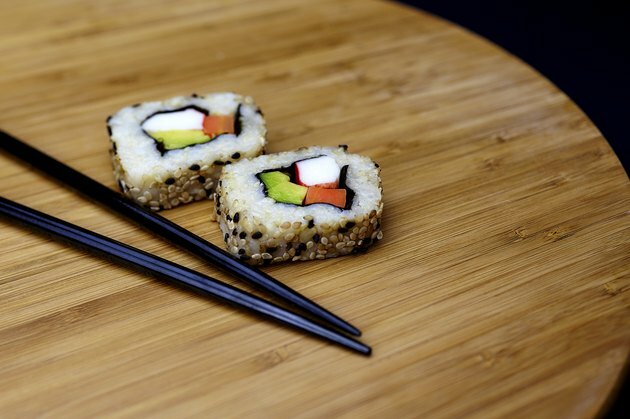 Brown rice contains more nutrients than white rice, and while brown rice sushi may not be traditional, when it’s well made there isn’t much difference from white rice sushi. Brown rice is generally not as sticky as white rice and is often more difficult to work with when making sushi. The easiest way to enjoy brown rice with sushi is in sushi rolls made with sheets of dried seaweed called nori. The possible combinations of vegetables and fish that can fill a sushi roll are nearly endless. California rolls, made with imitation crab, avocado and cucumber, are probably the most common and well-known. The calories and nutrients in sushi vary significantly between food producers based on the amount of rice used and the types of ingredients. A typical California roll contains 300 to 360 calories and about 7 g of fat. Brown rice sushi has very little to no cholesterol but is often high in sodium, with 500 to 1,000 mg per roll. There is about 9 g of protein in a California roll. Carbohydrate content ranges from 51 g to 63 g in each roll. A brown rice California roll is a fairly good source of vitamin A, vitamin C, calcium and iron. Nori is the seaweed most often used to make sushi rolls and is a low-calorie food packed with nutrients. One sheet of nori contains only four calories and less than one gram of fat. Nori has a high mineral content, with 50 mg of potassium and measurable amounts of iron, calcium, magnesium and phosphorous. Nori is also high in fiber, vitamin A, vitamin C and B vitamins. Seaweed is anti-inflammatory and antimicrobial, and may possess anticancer properties, notes the National Oceanic and Atmospheric Administration. When rice is harvested, the outer hull is removed to produce brown rice. The bran and germ remain on brown rice and they give the rice its color and nutrients. One cup of brown rice contains 112 calories and no fat. There are 23 g of carbohydrates and 2 g of protein per serving. Brown rice is a good source of fiber, vitamins, minerals and antioxidants. Brown rice is a whole grain, foods essential to a healthy diet. National Oceanic and Atmospheric Administration: What is Seaweed?